Thank you for your generous donations which resulted in Fall Fest being a huge success. We raised $12,029.33!!!! Our Fall Fest donations, coupled with Dress Down for Dollars, allowed us to order five new Promethean Boards. 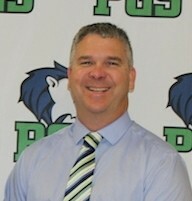 Each grade level will receive at least one new board. Again, I cannot thank you enough for your generosity and support. Please follow the link to learn more about Promethean Boards. Join other Tennesseans who are choosing to live healthier lives! Healthier Tennessee is a movement calling us all to come together, with the goal being to seek and make more positive changes leading to optimal health. The program promotes increasing physical activity, eating smarter and cutting out tobacco. You can learn more by visiting their website at www.healthiertn.com. Make breakfast a daily habit! Research shows that children who eat breakfast and are better nourished have better grades, behavior and school attendance. The Williamson County Public Health Dept. partnered the FSSD and administered Flu shots to students whose parents consented, on Thursday October, 25. Parents, remember the best way to help prevent your child from getting influenza, is to get a flu shot! 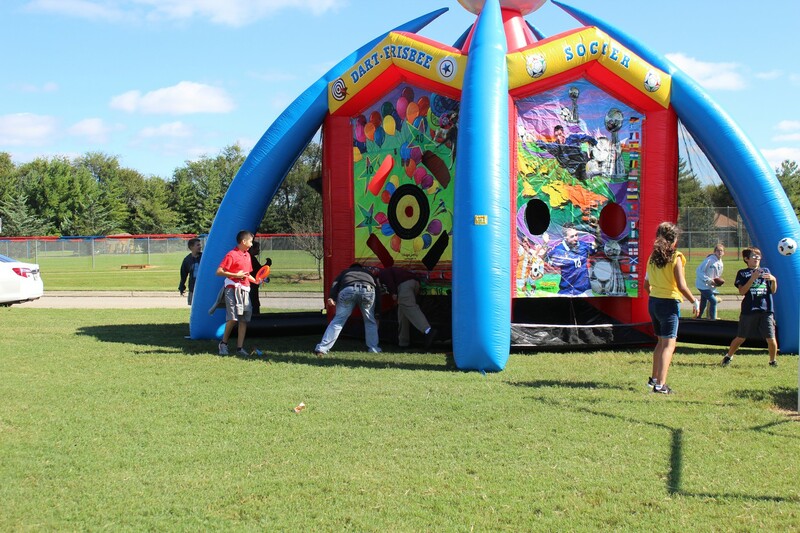 The 17th Annual World of Possibilities Career Exploration Day will be held Thursday, November 8, 2018 at the Williamson County Agricultural Exposition Park. 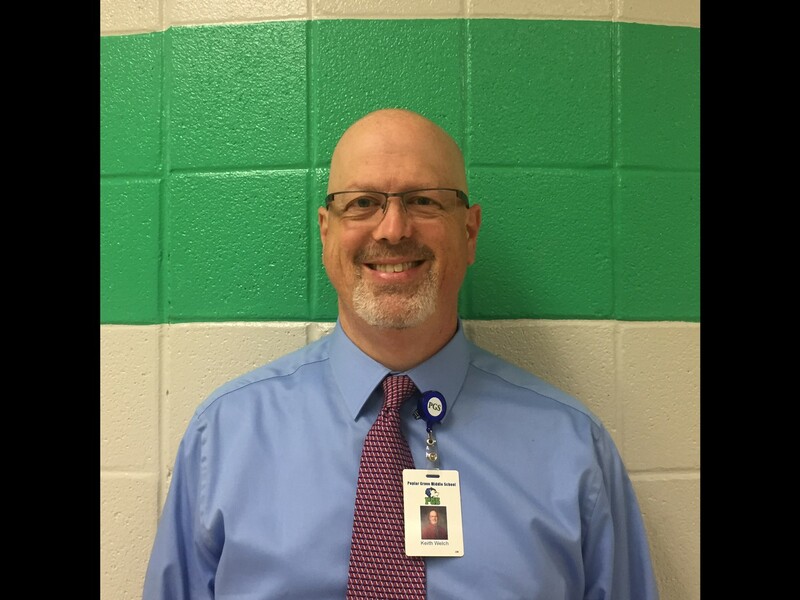 This comprehensive career day is being held to better inform eighth grade students about some of the career opportunities available in Middle Tennessee. 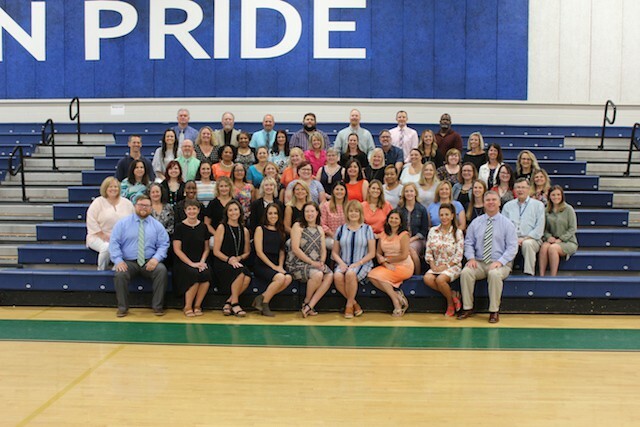 Williamson County and Franklin Special School Districts recognize there are specific workforce needs for Williamson County and Middle Tennessee. We are taking an active role to introduce students to career opportunities and other emerging careers by offering more career education within the curriculum. As our 8th grade students prepare for the transition to high school and begin to think about post-high school career options, the World of Possibilities Career Exploration Day is an excellent strategy for getting students authentically engaged in learning about careers. The 8th grade students will travel by school bus to the Williamson County Ag Expo Park and will be chaperoned by their teachers. Students will visit career exhibits based on their interests and ask questions to learn more about that particular career. We are proud to offer this opportunity to our eighth graders and we welcome your questions or comments. Fifth grade had a walking tour in Downtown Nashville. 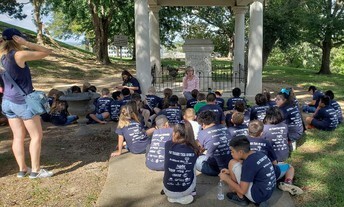 They started at the TN State Capital Building, and toured the Civil War and Westward Expansion sites. 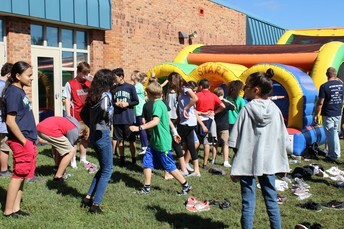 6th grade had a ton of fun at the Fall Fest! 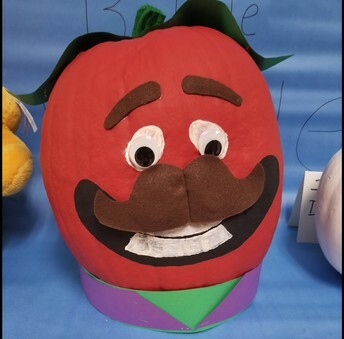 Mrs. Smithson's homeroom placed 3rd in the Pumpkin Decorating Contest, and Mrs. Miller's homeroom came in 1st! 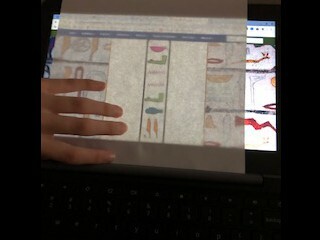 6th grade is going to be working on an Egyptian Museum project in Social Studies and ELA this coming month! Currently in Social Studies, they are working on writing their names in hieroglyphics. 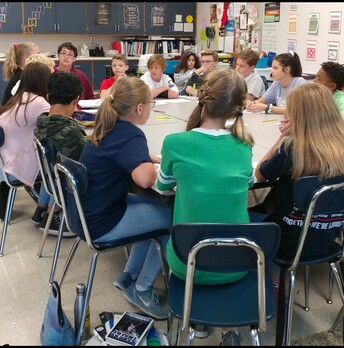 Students participated in a Socratic Seminar in Language Arts. The students are discussing a suspenseful story that was read in class. We used critical thinking questions that helped the students to understand the story on a deeper level! Is was not a debate but listening and evaluating the thoughts of others. PAINT THE FSSD PINK! On October 26, the FSSD wore pink in honor of Breast Cancer Awareness month. A big thank you to Mrs. Hillary Sledd for providing stickers for 8th grade! It’s time to model ecosystems! STEM sixth graders will use several different models to study ecosystems to better understand ecosystems in the real world. They will be observing the dynamic interactions between organisms and their environment. 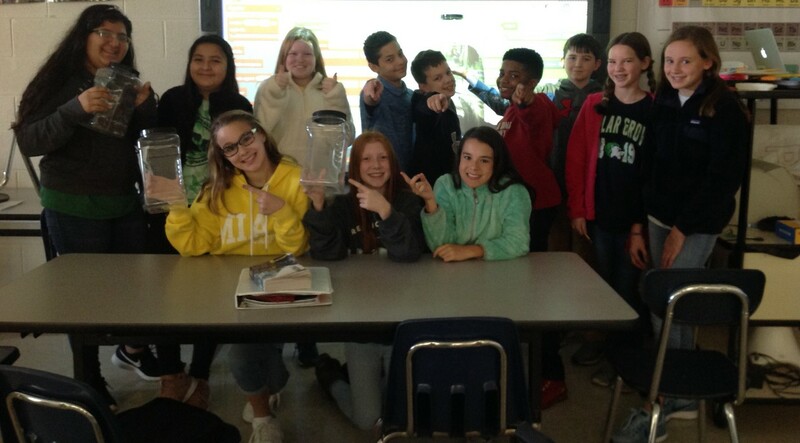 After planning and researching, students will create diagrammatic, aquatic biosphere (in a sealed jar), embodied, and computational models. Students will compare the different models determining pros and cons of each. 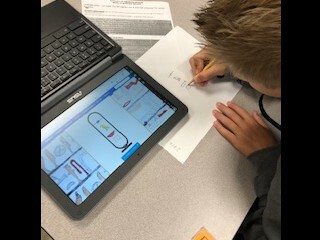 Kudos to these students who are becoming great computational thinkers! 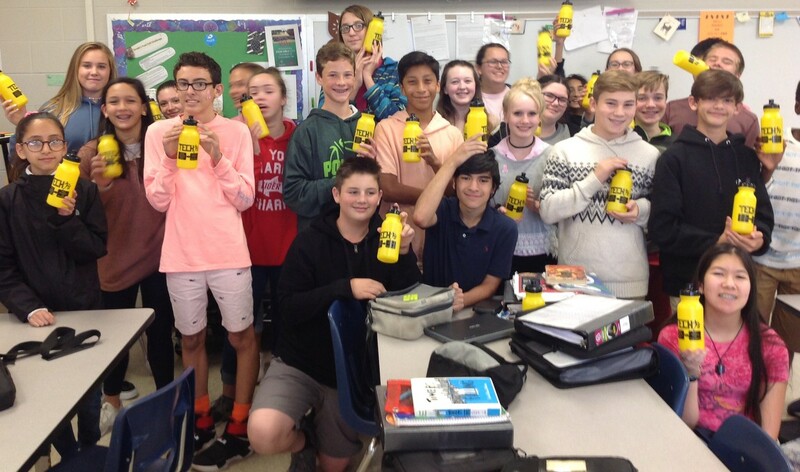 Ms.Lavery's 7th grade students had the unique opportunity to visit with Morning Pointe residents on October 23rd. This field trip and partnership connected students with the elderly. Students introduced themselves in Spanish, sang a song, and made the residents cards. We are very thankful for this partnership and know all the students enjoyed their visit to Morning Pointe. THANK YOU to everyone who helped make our Fall Fest Donation Drive a huge success! Below are some pictures from our fun day! October 12th was also a House Day full of great competitions and activities. And we have new point totals to announce! Coraticus is in 4th place with 2,520 points. Sapenta is in 3rd with 3,180 points. Reverentum is in a close second place with 3,490 points. And, Almitas is still in the lead with 3,525 points! 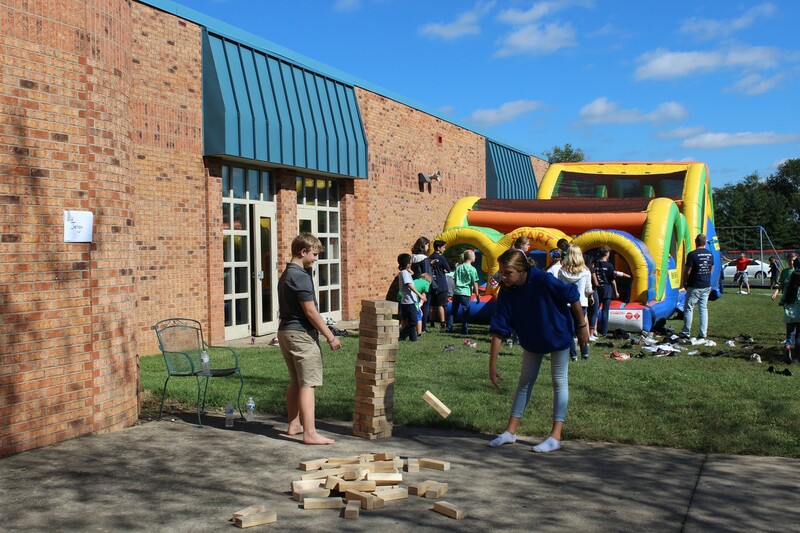 Don’t forget that students can continue to earn points for their houses by bringing in soda can tops, earning a spot on the Honor Roll, or participating in other activities. And our next House Day is Friday, November 16th. This year’s Be Nice ambassadors have been chosen to represent PGMS. 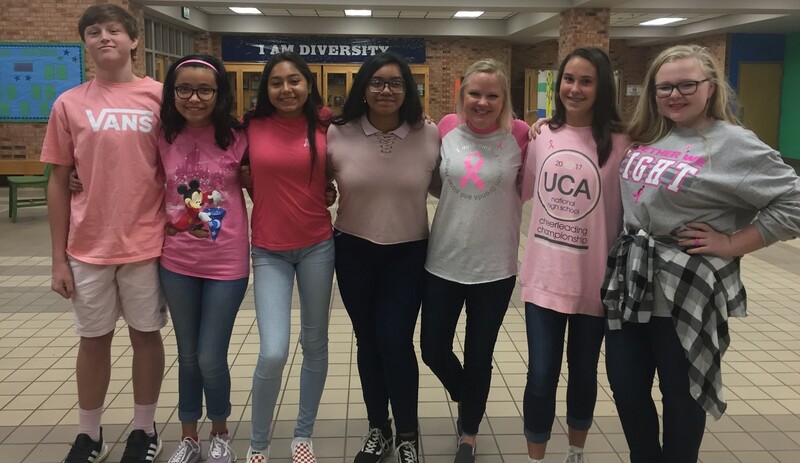 Audy Spain, Jonathan Covarrubias, Myia Kidd, Gael Garcia Valencia, Cooper Brown, and Sanjana Alokam will definitely do a great job at spreading kindness at Poplar Grove and beyond! Don’t forget that there will be a PBS Lock-in on Friday, November 9th here at the school. It should be a great time! The month of November would be a great time for parents and their students to discuss and be reminded of what it looks like to Be Responsible, Be Respectful, and Show Pride at school. At the beginning of the year, the students took part in many lessons over these topics; but it has been a little while, and it is important that they be reminded of these key areas of positive behavior at school. So, please take a few minutes today to brainstorm ways that your son/daughter can show responsibility, be respectful, and show pride each day at school. 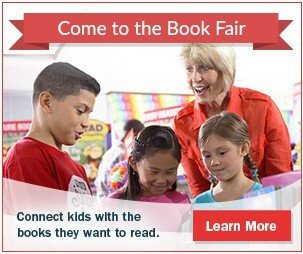 Join us for our ONLY Scholastic Book Fair this year Nov. 12-16 in the PGES Lobby. This is a fundraiser for both Library Media Centers. Shop for some great titles that make great holiday gifts! Join us on Thursday, Nov. 15 from 5:30-7:00 at PGS for a night of books, reading, writing, and resources. 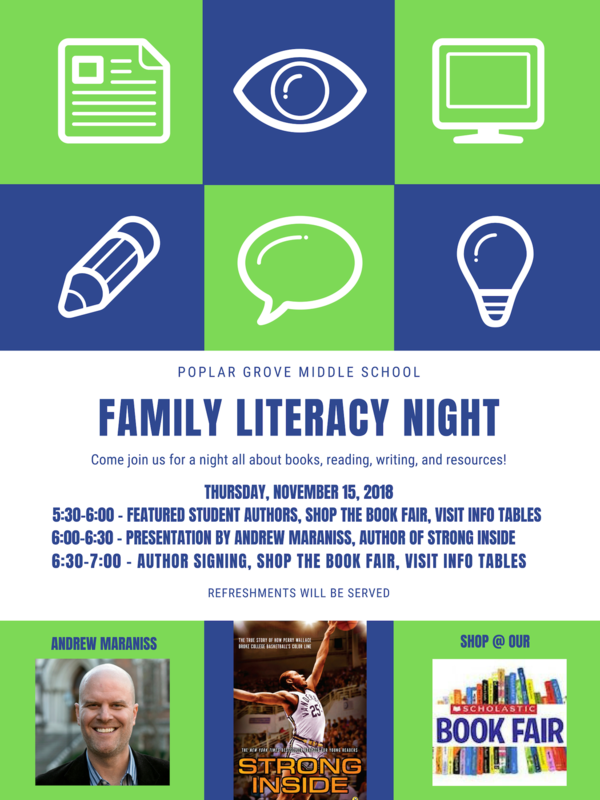 5:30-6:00 - Hear featured student authors, shop the Book Fair, visit info. tables. 6:00-6:30 - Hear visiting author Andrew Maraniss talk about his book Strong Inside: The True Story of How Perry Wallace Broke College Basketball's Color Line. 6:30-7:00 - Get your copy of Strong Inside autographed, shop the Book Fair, visit info. tables. Refreshments will be served. 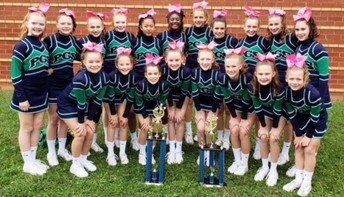 Congratulations to Poplar Grove Competition Cheerleaders! They competed at Blackman High School on October 13 and won first place in their division and Grand Champions! 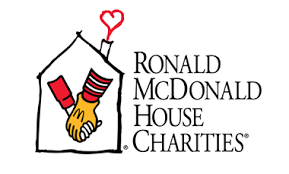 We are still collecting pull tabs for the Ronald McDonald House. The first update will be given on Monday, November 12th. The RMH challenge ends November 9th, but we will KEEP COLLECTING until May. In the lobby, there will be gallon containers under the House Point Board. When you have collected tabs, you can drop these into your house’s container. Where can you get the tabs? Soda cans, certain dog or cat food cans, soup cans……ANYTHING with a pull tab. As the containers get full, they will be emptied so the filling can begin again. At the end of the school year, the house that has collected the most pull tabs (in weight) will be the awarded 750 points. The REAL WINNER will be the Ronald McDonald House! 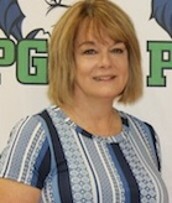 If you have any questions, come see Ms. Womack!